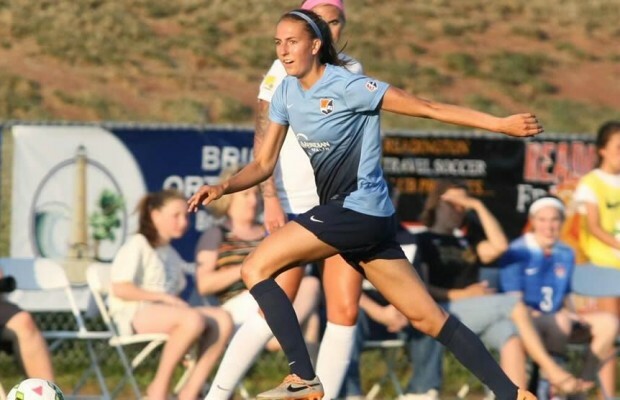 With her rookie season in the books, Sky Blue FC midfielder Sarah Killion’s club career now has her playing in Australia for the first time with Adelaide United, although she always has a convenient way to tune straight back into her Midwestern memory vault. After two USL W-League titles, a National Championship with UCLA, and a FIFA Under-20 World Cup winner’s medal, Sarah’s success as a key player for club, college and country would have been incredibly difficult to ignore. Alongside her individual capabilities, the 2010 ESPN RISE All-American had refined her team play considerably in her four years as a Bruin, earning her a call to the full National Team and making her a golden prospect ahead of the 2015 NWSL College Draft. Taken at number two overall by Sky Blue, her debut campaign had its positives and saw her play the majority of games, but also had her feeling shackled as she battled with a knee injury. The 23-year-old has since headed to Australia on a loan deal with Westfield W-League side Adelaide United and has already scored for the Lady Reds, netting directly from a corner on her debut. Although Sarah is long since familiar with the global travel of her trade this is the first time she has signed to a team quite so far from home. Raised in Fort Wayne, the three-time Gatorade Player of the Year for Indiana (while in high school) opened the book on the backdrop to her early years. “Growing up in Fort Wayne was actually very nice. I was lucky enough to have my entire family, and most of my extended family, in Fort Wayne all within a 30-minute drive. Season eight of the W-League is now underway and with Sarah doing her best to settle into South Australian surroundings she reveals one of the reasons why a feeling of home and all that signifies is often just the press of a button or two away. “I grew up on country music; there are times when I hear old country hits on the radio and I am surprised that I know every word of the song. It was the only radio station my mom and dad played while my two older sisters, Megan and Gina, and I were in the car. “Back then, I would love listening to hits from artists like Keith Urban, Montgomery Gentry, Jason Aldean, and Kenny Chesney, just to name a few. When I started high school and on in to college I began listening more to rap, hip-hop, reggae, and some alternative. “Since college I have found my way back to country music and strayed away from the rap and hip-hop. I would say my favourite artist right now is Ed Sheeran, who doesn’t really belong to any one particular genre. After Sarah, Sky Blue’s second pick of the 2015 College Draft, and the tenth overall, was a defensive standout from National Champions, Florida State. Back in August, Sky Blue forward and Denmark international Nadia Nadim was the featured player on here and she gave a behind-the-scenes insight into her teammates, which included naming this defender as the one who helps get the atmosphere going with her music before a game. The player in question is someone Sarah knows well and she picks out one of the tracks ‘Grubs’ throws on regularly. A one-time U.S. Under-18 player, Sarah had an unforgettable experience with the Under-20s in 2012. At the FIFA World Cup in Japan, her group went all the way in the tournament, with Sarah starting every game for Steve Swanson’s side. The success was sealed with a 1-0 win in the final over a Germany team who had beaten them 3-0 in the group phase. Current Houston Dash forward Kealia Ohai got the goal, while defender Julie Johnston – who this year was a mainstay in the senior team’s glory in Canada – led from the back as captain. Last year, Johnston recalled on here how the Chris Brown song ‘Don’t Wake Me Up’ always reminds her of the celebrations with the team from that game in Tokyo. Rolling back to a much younger age group, Sarah describes the party that was her game day routine long before lifting major silverware ever came close to entering the equation. “I was around five years old when I bought my first CD – it was the Backstreet Boys! I loved it and I knew every single word to their songs. As players (and indeed, people) are exposed to new surroundings, groups and challenges, their understanding of how they fit into a wider picture and a greater collective goal naturally develops. This is something Sarah can appreciate and it has undoubtedly stood her in good stead the further she has started to go in her career. Back in high school, it is fair to suggest that there was more individual onus on her as a player, as she starred for Bishop Dwenger with 63 career goals and 73 assists. The former Fort Wayne Fever youngster has a lifelong faith, with music acting as a particularly powerful device for allowing her to connect with it. “I grew up Catholic and as of recently I have been exploring some Christian Churches as well. I even have a Spotify playlist with only Christian music on it and I really enjoy listening to it. The closeness felt by a soccer crowd to the occasion and their team can be likened to the bond that is often found at a live music show. While there is a real charm about being able to enjoy a band or artist’s performance within an intimate venue there is also a rush that comes with getting the chance to go and see one of your favourites in a larger-scale setting, as Sarah did recently. “Just a few weeks ago I was able to go to one of Ed Sheeran’s concerts. I have been wanting to see him for years and I was thrilled that it finally worked out! In March 2013, Sarah was a winner with the Under-23s at the Four Nations Tournament in La Manga, Spain, starting the 2-1 victory over England in the final along with midfield counterparts Morgan Brian and Vanessa DiBernardo. 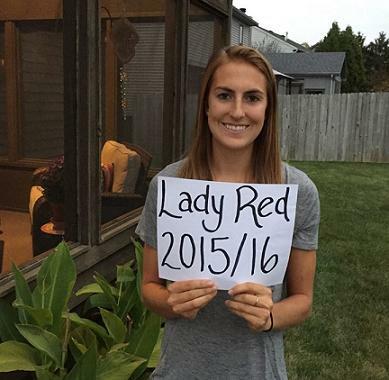 A senior call would follow some months later, as she was named by Tom Sermanni in his 24-player camp for the Algarve Cup in February 2014. That recognition had come not too long after she lifted the National Championship with UCLA. Kodi Lavrusky’s goal sunk Florida State in the final showdown and alongside Sarah in the blue and gold that day was New Zealand forward Rosie White. 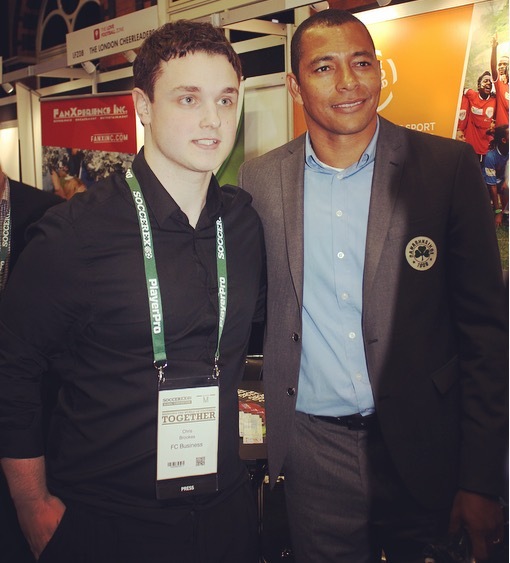 The current Liverpool player had scored the winning penalty in the semi-final shootout with Virginia en route to the success and she was a recent interviewee on this site. One of the music memories of her days as a Bruin she highlighted was an off-the-cuff vocal display from a certain defender, which Sarah also brought up first in this conversation. “Like Rosie White said, I will never forget Belden Long belting out a Kesha song on the bus on a road trip with UCLA. I will also never forget Gabbi Miranda and Alyssa Alarab putting on an amazing show for us at Cassie Sternbach’s house during preseason; they are both so talented and when they sang together it was even more special. In her Championship-winning year as a junior, Sarah made the College Cup All-Tournament Team and was a huge creative outlet for the Bruins, with a personal and school-record 12 assists. She equalled that tally as a senior and had by far her most productive season for scoring, notching nine times to finish her UCLA career with 13 goals, 32 assists and 58 points. An NSCAA 3rd-team All-American, 2014 also saw Sarah named the Pac-12 Scholar-Athlete of the Year and included in TopDrawerSoccer’s Best XI (first team). A defender and fellow Bruin who made it to the NWSL last year (for Washington Spirit) was the one who stipulated a lot of the soundtrack to Sarah’s UCLA days, and she also happens to be one of the other Americans currently featuring in the W-League, with Newcastle Jets. “The main locker room DJ at UCLA was Megan Oyster, also known at that time as DJ Meggles. She was great at it and we listened to a very wide variety of music, from ‘Honey, I’m Good’ by Andy Grammer to ‘Man! I Feel Like a Woman’ by Shania Twain. While still in college, Sarah had some memorable winning experiences outside of UCLA. In 2013, she was in the Pali Blues midfield alongside Abby Dahlkemper and Ashley Nick as they won the USL W-League with a 1-0 victory over Laval Comets. The team, notably represented in the past by future National Team stars including Christen Press, Alex Morgan and Lauren Holiday, merged with LA Strikers in late-2013 to become LA Blues. Sarah was celebrating with the Blues in July last year after another W-League success, which was sealed with a 6-1 win over Washington Spirit Reserves at the IMG Academy Stadium in Bradenton. It was the same venue that had hosted Pali Blues’ aforementioned 2013 Championship victory and this time Sarah scored one and set up two, as well as winning the W-League Championship MVP. She also fittingly marked the moment with vocal brilliance…or was that down to her backing singers?! “I have never had to sing for a team that I played on, and for their sake I hope that I never have to. I did get up with a group of girls from my LA Blues team after we won the championship on my 22nd birthday and sing ’22’ by Taylor Swift. It was the Blues’ fourth title in seven years and they achieved it in style, scoring 62 and conceding just six as they won all 15 of their games in 2014. St. John’s University standout Rachel Daly and FC Bayern striker Katie Stengel were the focus of their own features on here during their time with the Blues that season and Sarah took the chance to give a shining assessment of the pair as she reflected on her memories of the team which sadly folded last November. “I truly enjoyed playing with the LA Blues for two summers in a row. During summer time at UCLA, we go through the same schedule every day: get up, work out and run hard to get ready for preseason, and then go to class most of the day. “At the end of the day it was so nice to go train with the Blues or have a game or two on the weekends. The exposure to a different style, different players, and different coaches was helpful both on and off the field. After logging 77 starts in her 88 UCLA appearances, Sarah stepped up to the pros and started 13 for Sky Blue this year, with four more coming from the bench. To look at the fact she featured in all but three of the team’s NWSL games would suggest she was at, or pretty close to, top condition. However, the campaign was particularly testing for Sarah and handed her a few lessons along the way. “For most of my rookie season I was battling with an injury; it was one of the hardest things that I have ever gone through in my career. I learned a lot about myself throughout that time. “I learned that I have to be patient, that some things can’t be rushed. I also learned that the NWSL is a long season, and you have to be smart mentally and physically if you want to be at 100% for the entire season. “I was surprised at how fast it went. I thought that having only one game a weekend instead of two – like at UCLA – everything would drag itself out. “Instead, it just made game day even more exciting. I would be itching to get out on the game field. “I was lucky enough to have a group of girls who joined a Bible study group. This group of girls had so much influence on how I was dealing with my injury and all of the adversity of a new team and rookie season. Although Sky Blue ended Jim Gabarra’s last season at the helm in 8th position, the side were only two points back from 5th-place Houston Dash. Like many of the league’s teams, they had to deal with the loss of numerous players competing in the World Cup, with U.S. duo Christie Rampone and Kelley O’Hara just two of those who were missing. From front to back, Sky Blue had characters and a strong group ethic in 2015 and as Sarah was asked which teammates she’d choose to record a song cover with she revealed that it wasn’t just tactics they refined as the months went by. “I think that a music video performed by Hayley Haagsma and Nikki Stanton to Silentó’s ‘Watch Me’ would be entertaining. I could do that singing since it’s more of a rap anyway and no one would have to hear my awful pipes, and they could do all the dancing. Ahead of what next season in the States may hold in store, Sarah’s midfield talents are currently on show for Adelaide United. 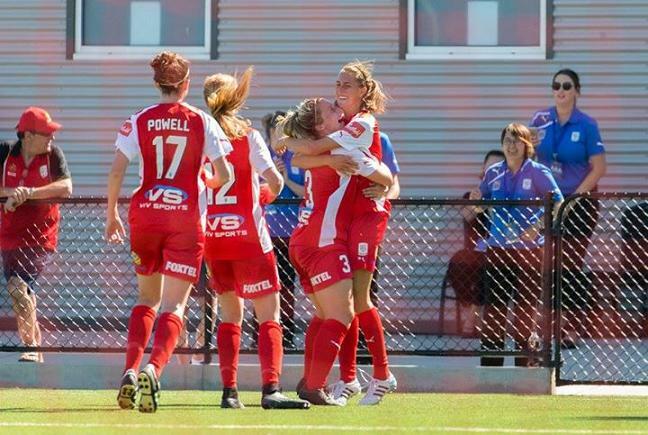 The Lady Reds started their W-League campaign by coming from 2-0 down to draw with Western Sydney Wanderers thanks to a goal direct from Sarah’s corner and an effort from Tiarn Powell. 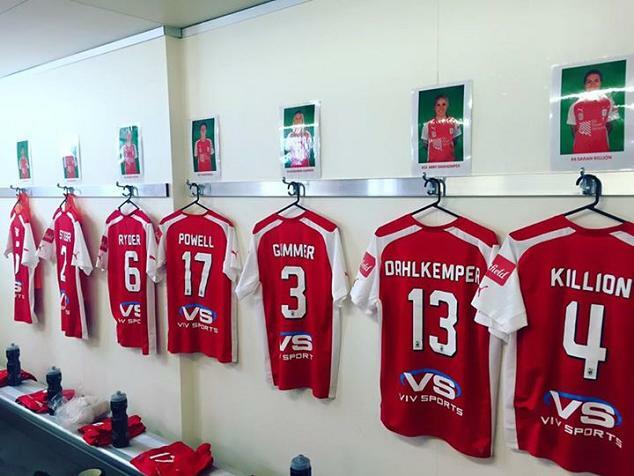 That was followed up with a 2-1 win at Brisbane Roar at the weekend, with Emily Condon and Rosie Sutton on target, and in addition to goalkeeper Kaitlyn Savage, the Reds have another American in the squad – Western New York Flash defender Abby Dahlkemper. She is someone Sarah knows extremely well from their days at UCLA, as well as with Pali / LA Blues, but she has felt a strong sense of familiarity all-round since arriving in South Australia. “Australia is beautiful, and my team in particular could not be more welcoming. They are such nice people and so genuine. “My roommates took me to a place called The Market Shed recently; it’s like a really healthy farmers’ market with so much to see, eat, and drink. It was right in the middle of the city in Adelaide and we will be back every week, no doubt. While with her Olympic Development Program Region-II team, Sarah travelled to the likes of Germany, Portugal and Costa Rica. She is now ensuring Adelaide has a small part of Indiana in it wherever she goes and she illustrates in more detail just how her home city shaped her. “Looking back, I loved growing up in Fort Wayne. Everyone looks out for each other and I was blessed to be able to look up to two amazing parents who were such hard workers; it’s the only way I knew how to live. “It’s a place where things are pretty quiet, but the majority of people are content with that. People work all day, but they also know how to have a little fun with friends and family. Upon calling her up for her first senior National Team camp, Tom Sermanni spoke of the technical proficiency Sarah possesses. Coach of the newest NWSL expansion team, Orlando Pride, he also commented on her calmness and composure under pressure, and Sarah explains how she likes to also have a clear mind off the field. “I love getting into a good book and having some downtime to just relax. My family is important to me, so any chance that I can get home to see them and spend quality time with them is one of my first priorities. “I also love spending time with my friends, possibly cooking a meal together or watching a movie. I have a few different ideas about what’s ahead. At this early point in her career, Sarah has shared the journey with a whole bunch of players and worn the jersey of various teams. From her days of lighting up the game at high-school level with Bishop Dwenger, to finally stepping out as a professional soccer player this year, she has learned a great deal about what makes her the midfielder she is, and far more besides. Each player interviewed on this site is asked a concluding question which, although admittedly a tricky one to answer for many people, provides a genuine insight into what they like to be surrounded with in terms of teammates. The idea is for them to pick four of those they have worked alongside to go with them into a fantasy 5-a-side line-up, for whatever reasons they decide. Here are just some of those Sarah has loved working with up to now, with one current teammate in there, and a clutch of others she would jump at the chance to have on her side again one day. “Keeper: Katelyn Rowland – I would choose Katelyn because she is an amazing keeper and I know she is going to bring it every time she steps on the field. She is so competitive and so hard on herself that it has pushed her to become one of the best keepers I have ever played with. “She is intense and she wants to win, and I love that about her. Defender: Abby Dahlkemper – Abby and I have had a connection on and off the field from freshman year at UCLA. “There are times on the field even when I don’t see her I know exactly where she is behind me. She is another player who is extremely competitive, but most of all, she is a smart soccer player. “She understands the game, and therefore, can read the game extremely well. She is not only one of the best one-v-one defenders I have ever come across, but her technique on the ball, her ability to knock a long ball, and her long-range shooting sets her apart from other players. “Midfielder: Morgan Brian – there is a reason she is on the full (U.S.) team. Morgan is one of the best players I have ever played with and I loved playing in the midfield with her and Vanessa DiBernardo for the U-20 National Team. “Her technical and tactical skills are excellent and I love being in the midfield with another player who loves to play one and two-touch soccer. She is one of those players that can see things before they even happen, and again, her competitive nature and mental toughness is just another aspect that makes her the amazing player that she is. “Forward: Katie Stengel – I have always loved playing with Katie whenever I was given the chance. She is one of the smartest forwards I have ever played with. “She can bring the ball under control no matter how it is played in to her, and when there is no one there for her to lay it off to she will still find a way to keep the ball. She connects with the midfielders because she is such an intelligent player.